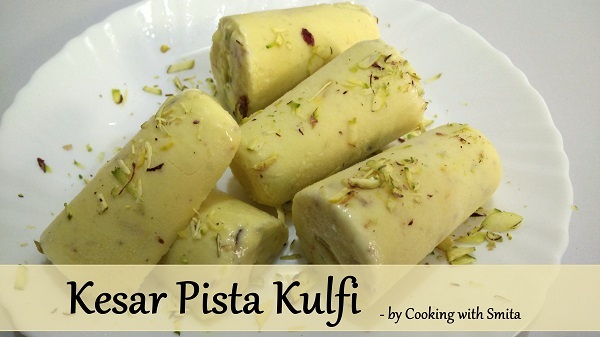 Kesar Pista Kulfi Recipe, a mouth-watering frozen Indian dessert is perfect for summer. It is loved by people of all ages and a great dessert to serve at the party. Follow this step-by-step recipe guide on How to make Kesar Pista Kulfi at home with full-fat Milk, Saffron & Pista. You can also watch my earlier video of Malai kulfi recipe on my channel. Heat Milk in a Kadai over medium flame till it starts boiling. Lower the flame, stir occasionally and boil till it reduces to half in quantity. Take a small bowl, mix some hot milk with saffron strings and keep it aside. After 20 minutes, add Sugar in Milk and mix well. Add Milk powder (in small quantity at a time) and stir to make sure there are no lumps. Stir occasionally and boil Milk for another 10 minutes. After 10 minutes, add Cardamom Powder, some Pista, Almonds and Saffron Milk, mix well. Kulfi mixture will thicken after cooling to room temperature. Pour the Kulfi mixture into Kulfi Moulds. Keep in freezer for 6 – 8 hours until set. Unmould the Kulfi and serve immediately.